32 teams, more than ever before, will take the sandy courts of Catania, Sicily, when the EHF Beach Handball Champions Cup takes place on the Italian island from 1 to 4 November. Following a decision by the EHF Executive Committee (EXEC), for the first time 16 teams each have been confirmed for the men’s and the women’s event. Registration for the final event of the 2018 beach handball season started at 8:00 hrs in the morning on 27 August, and interest from eligible teams across Europe was unprecedented. “At 8:02 hrs we were fully booked for the initial 12+12 places, at 8:04 hrs we had received the final registration for this year’s EHF Beach Handball Champions Cup,” says Ole Jorstad, Chairman of the EHF Beach Handball Commission. “This is a great sign for the interest in our sport and really lifts the EHF Beach Handball Champions Cup to the next level. “As places were allocated on a ‘first come, first served’ basis, sometimes only seconds decided which teams were eligible to play. 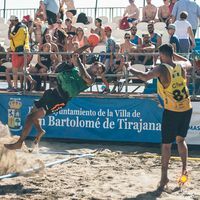 “The Beach Handball Commission therefore decided to extend the field to 16 + 16 participants and asked the Executive Committee for a final approval of this decision,” says Jorstad. With 16 + 16 teams in action, the EHF Champions Cup will be played on three courts instead of two. Group distribution and the playing schedule will be announced in due time. The EHF Champions Cup will be accompanied by several educational measures for beach handball coaches from 30 October to 4 November. For the first time, the Italian federation organises an education course on the national level, while the European Handball Federation holds its first ‘Level 2’ course for beach handball coaches. This is the tenth beach handball course overall, but the first for which the attendance of a previous course is a requirement. “This is a new milestone for our beach handball education,” says EHF Office beach handball staff member, Ivana Jelic. “We are looking forward to this new course which will offer expert individual and team skills as well as the newest insights into goalkeeping, conditioning, coaching, scouting and much more,” says Jelic. The registration deadline is 20 September. More information is available in the course brochure which is available for download below.